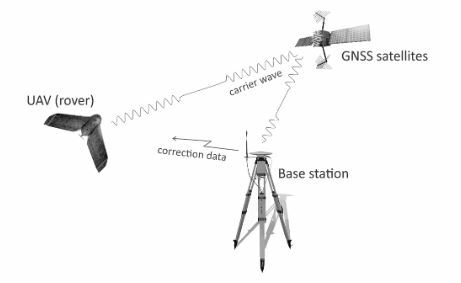 For those new to UAV mapping operations or traditional airborne data collection, the idea of establishing Ground Control Points (GCPs) in a study area may be a new concept. Let’s start with a definition: Ground Control Points are identifiable points on the surface of the earth with known locations, which are used to georeference the data being captured. Clear as mud? Okay, let’s break this down a bit further. I’ve organized this post into a number of different questions that came to mind when I first started to work with GCPs on project sites. What does a Ground Control Point (GCP) look like on site? A GCP may take the form of a man-made target, or it may just be recorded on a pre-existing object in your study area. Whatever it is, it is important that it will be visible in your photos after you fly the drone mission. Figure 1 gives some different examples of how GCPs may look like in the field. Details on how to set up targets are provided later in this post. You can order air photo targets online, or make them yourself. If you are going to make them yourself I would recommend using a material that can be folded and easily transported, such as pool liner, which can also be painted with your preferred markings. Make sure grommets are installed in the corners to have a method for spiking them into the ground. Fig 1 – Two types of ground control targets that could be set prior to a UAV mapping mission. Why should we establish ground control? The main reason we want to set up ground control is to be able to accurately georectify the UAV imagery that we are stitching together. In other words, this process allows us to stretch and warp the imagery to an absolute real-world position, while removing distortions. This improves the horizontal (X,Y) and vertical (Z) dimensions of the final dataset. What equipment do I need to establish GCPs? The first step is to ensure you have access to a professional (industrial grade) GPS unit. The specific type of GPS being used to record ground control points may vary depending on the client’s expectations of accuracy in the final product, so I won’t go into great detail here. When delivering professional mapping and survey data products, I make sure to use an industrial grade GPS such as those in the Trimble GeoExplorer 6000 series. The Trimble GeoXT, for example, will achieve sub-meter accuracy which meets the needs for a wide variety of applications. This is just one suggestion; it is important to allow the client and their end goals guide the level of GPS precision that is required. RTK accuracy (at the cm level) may be desired by the client, depending on the end use. What are ground control targets and how are they involved? If ground control cannot be recorded off of a permanent feature in your study area, targets need to be present, and must be visible in the air photos taken by the UAV. Recently, I have been flying a lot of mapping missions just below the maximum allowable altitude here in Canada, 120 metres AGL (~393 feet AGL). When creating ground control targets for flights at this altitude, I have found that making the targets 1.5 x 1.5 metres wide is a useful size. This makes it efficient to find and mark them in your imagery stitching software (e.g. Pix4D) after the flight is complete and data is collected. At 80 metres AGL or below, 1 x 1 metre targets will usually work well. Optimal target size also depends on your camera’s resolution and zoom level, so it is best to test this yourself while taking my recommendations here with a grain of salt. It is important to remember that GCP targets can take different forms. You can place material targets on the ground, paint some targets, or use a permanent object/feature in your study area as a control point and record its coordinates. Using spray paint or flagging tape can be a convenient option, as you don’t have to retrieve any physical targets after your flights, which can be time consuming. With paint, it’s not always acceptable to use it on site, plus it will fade over time. The user should be sure to check with land owners before applying permanent or semi-permanent markings, and be aware of sensitive environments where it may not be a good idea. I would recommend trying to use existing man-made features as a first choice, which can be challenging in rural and remote environments. If you are seeking out a permanent feature, this could be a manhole cover, a fence corner, or the convergence of painted lines in a parking lot, to name some examples. In the field, I usually ask myself: is this feature still going to be here in 3 years, and will I be able to easily and accurately mark it in the air photos? I have found that it’s best to choose features that are flat and in large open spaces, so they are visible in many photos and not just a select few. How many Ground Control Points should be established in my area of interest to achieve a professional orthophoto? This is easily one of the most asked questions that I hear when it comes to UAV mapping missions, and a question that seems to have an abnormally high number of different answers depending on who you ask. After a review of the literature and feedback from others, I generally aim for at least 8 GCPs on sites up to 250 hectares in size (2.5 km2). “A minimum number of 3 GCPs is required…. a minimum number of 5 is recommended…. 5-10 is usually enough, even for larger projects.” (Source: Number and distribution of GCPs – Pix4D Knowledge Base, 2016). RMSE errors are reduced and accuracy improves for easting, northing and height values when more than 6 GCPs are used. (Source: An Evaluation of Different Numbers of Ground Control Points in Unmanned Aerial Vehicle Photogrammetric Block, Universiti Teknologi MARA, Malaysia, 2013). “5 well-distributed GCPs are generally sufficient to get a Bundle Block Adjustment (BBA) with a good positional accuracy. The use of 10 GCPs on the BBA is not proven to offer a significant improvement in the accuracy.” (Source: Systematic Analysis of Unmanned Aerial Vehicle (UAV) Derived Product Quality, Nasrullah, A.G., 2016 – thesis). After all of that discussion, there isn’t always a quick answer to this question. If you are focusing on survey and volumetric output, additional ground control points are often useful. Also, checkpoints (discussed below) should be recorded in addition to the various GCPs that are being recorded. Personally, I try to record 8-10 ground control points on my usual sites and I’ve had good results with that, but it can vary depending on the site layout and the expected data outputs. How should I arrange the GCPs on the ground? There are some standard principles to abide by when arranging GCPs in your area of interest. First, you want to distribute the GCPs evenly throughout the study area and avoid placing them too close to the edges (or corners), as those targets will only show up in a limited number of photos. Secondly, try to avoid placing them in a straight line pattern, but rather disperse them to create more links between flight lines and subsequent photos. It’s best to think of your study area as a sheet of paper with a strong wind blowing against it, and your goal is to pin it down to keep it as stable as possible. Think of these “pins” as your ground control points, placed strategically. What challenges are commonly encountered when establishing GCPs? It can be challenging, and very time consuming, to place ground control on remote sites with limited access. For example, I was at a site recently where there was a single forest service road along the edge of our study area but no other access to speak of. Our only options for ground control were small pullout areas on the edge of this road, which didn’t allow us to distribute our GCPs evenly throughout the study area as we normally would prior to flight. Use a mobile mapping application such as Avenza Maps to plan the location of your GCPs, and to navigate while establishing GCPs. This is a great tool to visualize where you are within your area of interest, and to properly balance your GCPs within the area to be flown by the UAV. It will also help if you need to retrieve any targets after the flight. If your study area requires multiple flights for full photo coverage, make note of the areas where there will be overlapping flight lines. If possible, establish GCPs in this narrow swath to help to tie photos from different missions together. I often place GCPs at a higher density in these specific areas when possible. I have heard that ground control is not necessary on some UAV mapping missions. What am I missing? The 3D model associated with the imagery capture will be greatly improved with GCPs. If the imagery is only being used as a quick reference (e.g. Initial site reconnaissance), then it may NOT be necessary to achieve a high level of accuracy when it comes to the orthophoto and the subsequent data products. Perhaps the GPS in the UAV has assigned a basic geotag to each photo, and this is enough to stitch together a useful mosaic for the end user. An example of this type of scenario is perhaps a crop damage assessment. By viewing the loosely georeferenced imagery, the farmer will still have enough information to generally determine where and how much damage was incurred by the recent storm. The presence of ground control points (and the associated accuracy) in this scenario may NOT be crucial to the final deliverable. In other words, this data may NOT need to be imported into a GIS, analyzed with other datasets, or loaded into a machinery for precision applications, to name a few examples. The end user will still be able to visually assess the study area, and measure distances or areas on the stitched mosaic since it will still maintain relative accuracy (it just won’t be in a refined absolute location). One technological advancement that is starting to creep into the feature set of newer drones is the use of direct georeferencing. This refers to the utilization of RTK GPS and a very precise IMU to georeference captured data to the centimeter level with no ground control points. At the time of writing, there are very few mainstream commercial UAVs with direct georeferencing capabilities, but one example is the eBee RTK from Sensefly. The presence of a ground station is necessary here, to pair with the UAV. After dealing with its steep price tag, this UAV allows the user to drastically reduce the number of GCPs needed. While some operators may operate with no ground control points in this scenario, it is still highly recommended to get a few GCPs for quality assurance. In a traditional RTK survey scenario the operator uses a base station GPS, and records points with a rover GPS. In this scenario, the UAV becomes the rover, and communicates with the base station in real-time (see Figure 2). Fig 2 – A direct georeferencing UAV setup, reducing the need for numerous GCPs. What are checkpoints and how do they differ from Ground Control Points? One aspect of a credible UAV operation is to verify the accuracy of the data that is collected, and to be transparent about it. It can be helpful for the UAV pilot, the project team and the end user of the data to know what level of accuracy has been obtained in the processed imagery. In Pix4D, checkpoints can be used for this purpose… they are not crucial to process your data, but are recommended. To create a checkpoint, you are basically recording a GCP in the field and then assigning it as a checkpoint in Pix4D. Once you assign a GCP as a checkpoint, it will not be taken into account during processing of the model – it’s sole purpose is to determine accuracy. Due to this, it’s best to have an abundance of extra GCPs set up in your study area if you are planning on using checkpoints in your project. This way, you won’t compromise your model’s accuracy, just for the sake of trying to provide more metrics to the end user. I’ve collected my GCPs in the field. What are the next steps? There are many ways to manage your ground control point data, depending on your GPS hardware and imagery processing software. I’ll briefly explain a common workflow that I use with a Trimble GeoXH GPS unit. After recording GCPs in the field and making sure the file is properly saved to my GPS unit, I sync the GPS to my computer. Using Trimble GPS Pathfinder Office software, I can apply differential correction to the collected points (to improve accuracy) using a local base station, then my data is ready to use in imagery processing. Since I use Pix4D for orthophoto creation, I will import a CSV that was created in Pathfinder, and use that to tie in photos in the RayCloud editor to my GCPs, and to assign checkpoints where necessary. Hopefully this post has provided a little more clarity on how ground control fits into the full UAV mapping workflow. Feel free to comment below to continue the discussion. Great article! Thanks. I do have an old GeoXH 2008 without any software. Can I still use that device? what software would you recommend and what will be the price tag? Hey Juan, given the specs of that handheld unit it still has good value to capture point and then post-correct them to use as GCPs. Check to see if the unit has TerraSync and GPS Pathfinder Office, which often come bundled with Trimble units. TerraSync will allow you to record the data and Pathfinder can help you post-process the points to tighten up the accuracy by using local base stations for correction. If you don’t have these programs I would give a quick call to a local Trimble dealer to inquire.